Description: A comprehensive guide to the history and world of denim and jeanswear In 1992 Sportswear International published the first Jeanswear Encyclopedia. 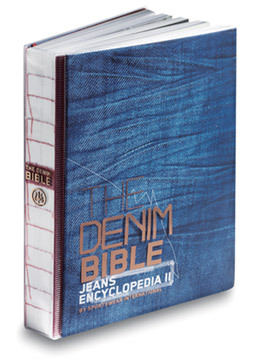 With the explosion of the jeans market fourteen years later, “The Denim Bible,” an updated second edition of the Jeans Encyclopedia, carries on the legacy of the first edition and explores in-depth one of the world’s most practical and universal garments. Its easy to access A-Z format provides an insider’s look into the heritage of one of the most internationally renowned garments: jeans. From the past to the present, innovators to the trendsetters, this indispensable resource tool is perfect for any fashion business or coffee table, and can also be an ideal gift for friends, colleagues and business partners. The book features eye-catching page layout and design. Sidebars are in the shape of back pockets. A series of time capsules offers insight into history-making world events, such as "Behind the Iron Curtain: Jeans Were There." Full page vintage advertisements are a great addition, and they complement the text. The ads show how blue jeans changed with the times, from cowboy gear, to a patriotic "Rosie the Riveter" wartime dress code for women, to 1960s protest wear. Photographs of the oldest pair of 501 jeans still in existence (dating from about 1879) attest to the durability and longevity of the style, as does the sensational Ripley's Believe it or Not! ad from 1939 depicting Tom Boyd's "26 mile crawl on untreated concrete—Wore out the man—but not the Lee Overalls!" 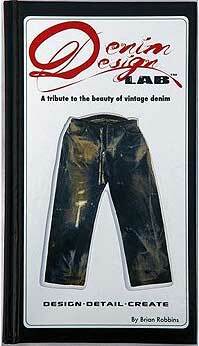 Description: Denim Design Lab™ was formed to help release the "inner designer" in everyone. Creativity, originality, and self-expression are necessary to help ensure we all move from the "plastic" to the "fantastic." We believe with the right roadmap, tools and inspiration, anyone can create original wearable works of art. The medium of choice here at DDL™ is denim. Denim is the "blank canvas" upon which we create, and we are here to help instruct others to do the same. Designed for the most discerning denim collectors, aficionados and fanatics, the Denim Design Lab™ Kit consists of specific tools of the trade used to hand finish and customize denim jeans. 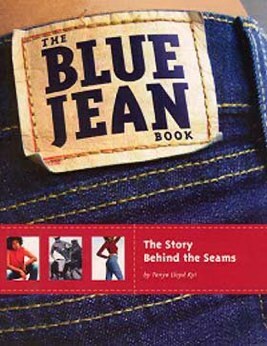 Each DDL ™ Kit includes a copy of the book "Denim Design Lab™," which features detailed instructions on achieving specific customized details, a comprehensive history of denim jeans and denim fabric, a review of the denim fabric and jean manufacturing process, as well as numerous historical and vintage photographs to serve as inspiration.